First God created Bacon. Bacon needed somewhere to live so he made Earth. But Bacon needed consumption, so he made people. But then stupid people shunned God and to punish them he put Bacon into pigs so that it was harder to get at it (before it was just walking around everywhere). 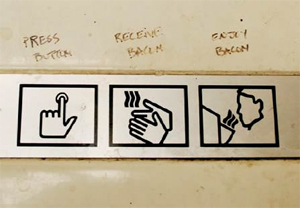 People defied God and found the Bacon, locked away. Once the secret was unearthed, it was sold to Burger King so that someone could go in and order a Whopper with 15 servings of Bacon on top, 4 slices per serving. And the man rejoiced, in his mouth was Bacon, in his heart was vindication, and in his soul he felt he had killed God.